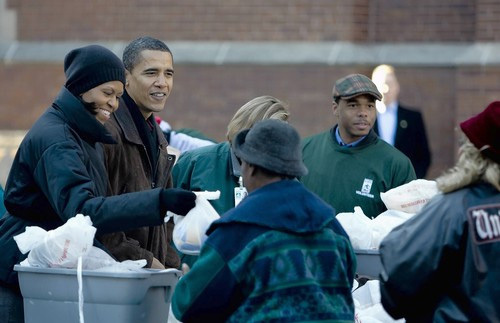 On Thanksgiving Eve, President Elect Barack Obama and family worked with the Greater Chicago Food Depository to distribute food at St. Columbanus at 7120 S. Calumet on the South Side. The Obamas said that they wanted to give their daughers, 10-year-old Malia and 7-year-old Sasha, “an understanding of what giving and Thanksgiving is all about,” said the Chicago Tribune. Obama also went inside to wish the children at the St. Columbanus school a Happy Thanksgiving. Ahhh…sweet. The Obamas’ interview with Barbara Walters also aired on Thanksgiving Eve. The couple discussed their upcoming administration and their move to Washington. 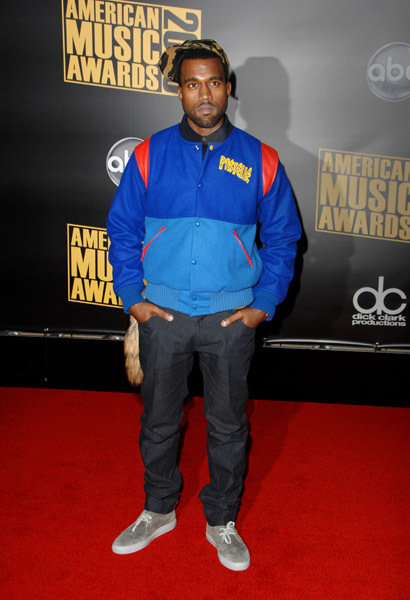 Kanye West won two awards for best rap/hip-hop male artist and best rap/hip-hop album tonight at the American Music Awards. 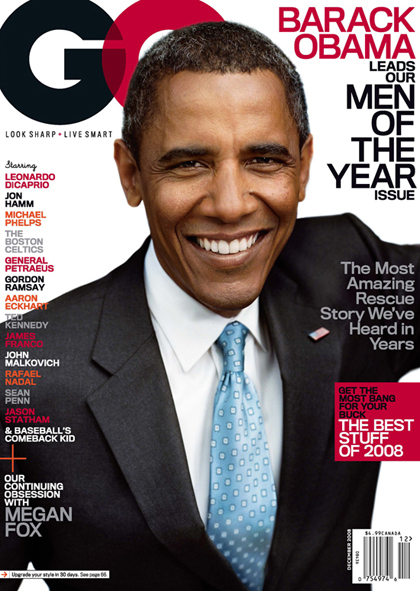 Barack Obama is on the cover of GQ’s magazine annual “Men of the Year” issue. Chicagoans are doing big things. Ow! U.S. President Elect Barack Obama and his wife Michelle give their first televised interview since the election. Check out the clip above of Barack discussing the reaction to his win. In the latest issue of OK! magazine, Michelle Obama discussed being wife and mother to the new First Family at their new address, 1600 Pennsylvania Ave. For more, check OK! site. 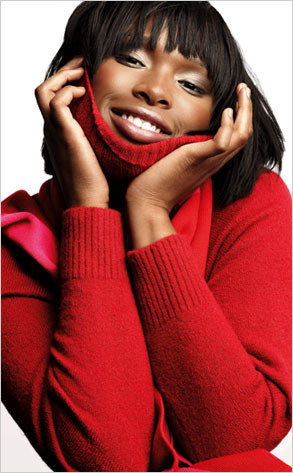 Jennifer Hudson will be featured in a new holiday ad for Gap. The photos were taken in July before several of her family members were killed in October. Gap considered pulling the plug on the photos but received the go ahead from Hudson to continue the campaign. “We felt that it was really important first and foremost to respect what she wanted to do so long as she felt comfortable with her campaign being out there,” said Olivia Doyne, Gap marketing and pr director. 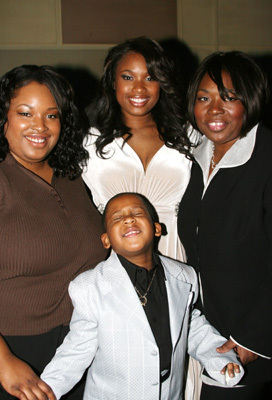 Jennifer Hudson and her family have been staying free of charge at the Donald Trump’s International Hotel and Tower on State St. since the deaths of her mother, brother and nephew on Oct. 24. The Secret Service names for the Obama family have been revealed. 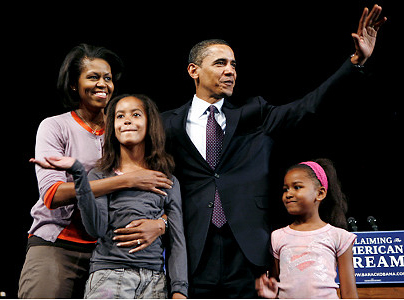 Barack is Renegade, Michelle is Renaissance, Malia is Radiance, and Sasha is Rosebud. Vice-President Joe Biden’s name is Celtic and his wife Jill’s name is Capri. President-Elect Barack Obama and his wife Michelle went to tour the White House Tuesday. His first visit since winning the presidential election. For more than an hour, President Bush and Obama spoke alone in the Oval Office. 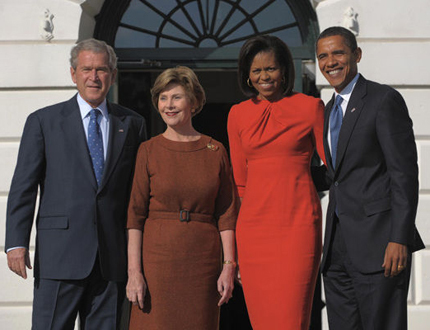 Laura Bush gave Michelle a tour of the living quarters where the Obama girls would live. Michelle also toured private schools for the girls while in Washington D.C.
William Balfour, Jennifer Hudson’s brother-in-law and a suspect in the Hudson family murders, will appear at a parole violation hearing before the Illinois Prison Review Board on Monday morning in Joliet, IL. Balfour was convicted for attempted murder in 1999. Balfour could be released if it is decided there is insufficient evidence that he violated his parole. 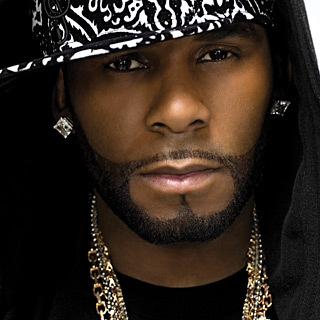 Brayel and Brandon Kelly, nephews of R.Kelly, have been arrested and are suspects in an attempted robbery of a Calumet City barbershop. Brayel,15, was shot in the abdomen and chest and is in intensive care at Advocate Christ Medical Center in Oak Lawn. Brayel and Brandon are two of the six children of Carey Kelly, R. Kelly’s brother. Rev. Jeremiah Wright, the former pastor of Barack Obama and the retired pastor of Trinity United Church of Christ, spoke Friday at Northwestern University. 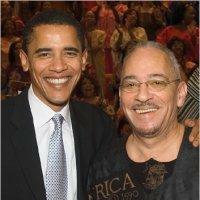 He expressed joy in the election of Obama and criticized the media for their unfair treatment of him.